It’s nice to see confirmation of something we deduced before – that the ‘bass’ channel legend for some reason was here left as ‘vibrato’, though there were no vib/trem controls. Presumably that was part of the evolving prototype design and re-use of stencils. Note too the appearance again of another detail – a MAINS legend shifted to the right. 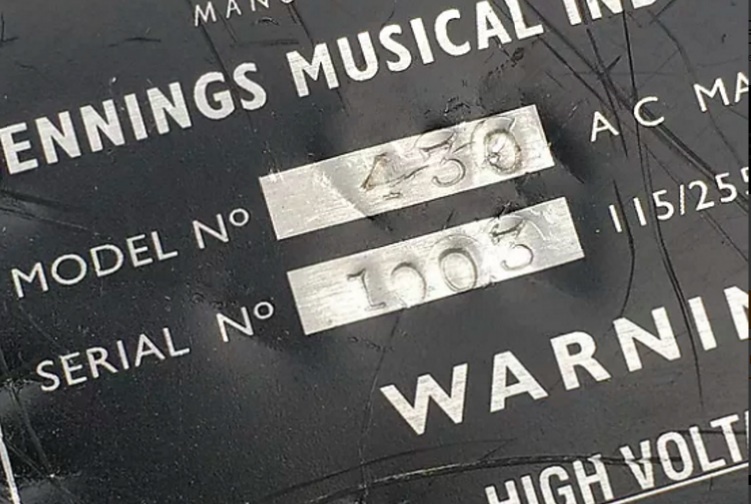 We saw this on one of the Beatles tour amps, so although the 430 is very different from their 120-watt units with vib/trem/reverb, this tells us a little about the production of their ones too. It would seem the shifted-legend wasn’t just an accident of production, but maybe part of a re-used stencil or set of stencils, an alternative layout that was dropped. Hard to tell what’s original – the inputs don’t seem to match – but there seems to be a Bulgin power connector needing extra support again. 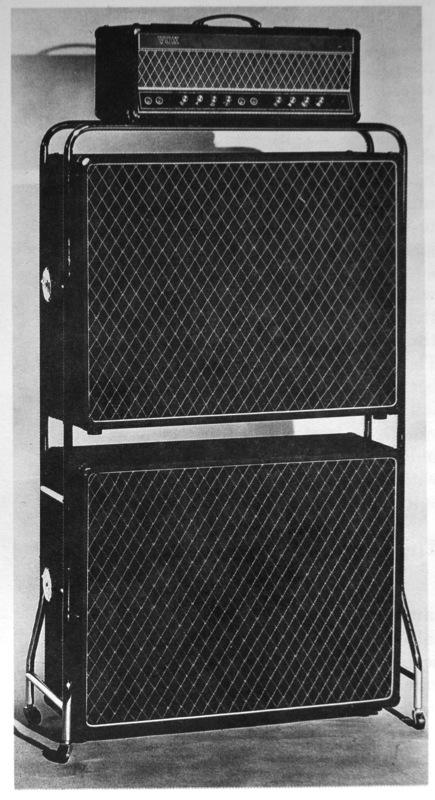 A 4-series amp, apparently a 460, used to illustrate an amp with a stacked cab trolley. Carl Nielsen recalls seeing the Troggs at the Orchid Ballroom (behind the Triumph building) with a similar set-up, on the revolving stage. He said he recently met the Troggs guitarist Chris Britton, and was able to tell him himself how great they’d sounded, and asked what happened to the amps. Chris told him that they’d finished a tour in Germany, and had arrived back, bringing the amps with them. Exhausted from the tour, they had switched the amps on for a session, but they’d forgotten to change the euro voltage setting on the back, and ….the amps were fried. From the panel though, we see that the one in the promo stack amp photo was a larger box – it was apparently in fact a 460 prototype. You can just make out a bit of silver on the right side of the top panel, where it seems originally there was going to be a model number. On this 430, there’s some worn silver there too – with what now looks to be what’s left of a ‘430’ legend. Given the wear, it’s possible that things like these individual numbers, and possibly the BASS on Paul’s amp & something undetermined on Bill Wyman’s amp, were added later. The fact that this is another finished proto amp, like the 4120 used by Bill Wyman on the ’66 USA Rolling Stones tour and others, suggests that the amps in the Vox Story and promo catalogue photos, which included a 7120, were finished amps (not just empty boxes with demo fronts). The 4120 and 7120 protos would seem to have already been large-box style, though with the single handles they looked similar to the smaller Beatles-sized prototypes.